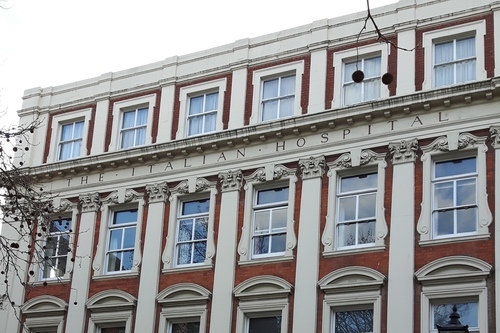 The former Italian Hospital in London can still be seen in Queen Square. "In the 19th century, London ethnic's communities were largely of European origin, with the French, German and Italian communities each having their own hospitals1. 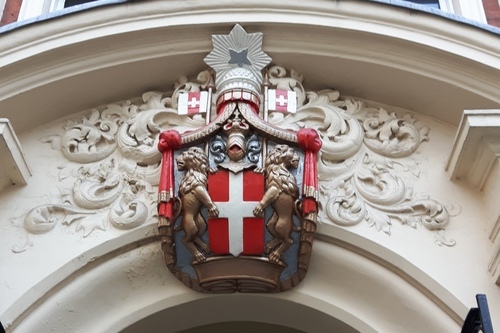 The Italian Hospital was founded as a charitable institution in 1884, in a house on Queen Square owned by London-based businessman Commendatore Giovanni Battista Ortelli. 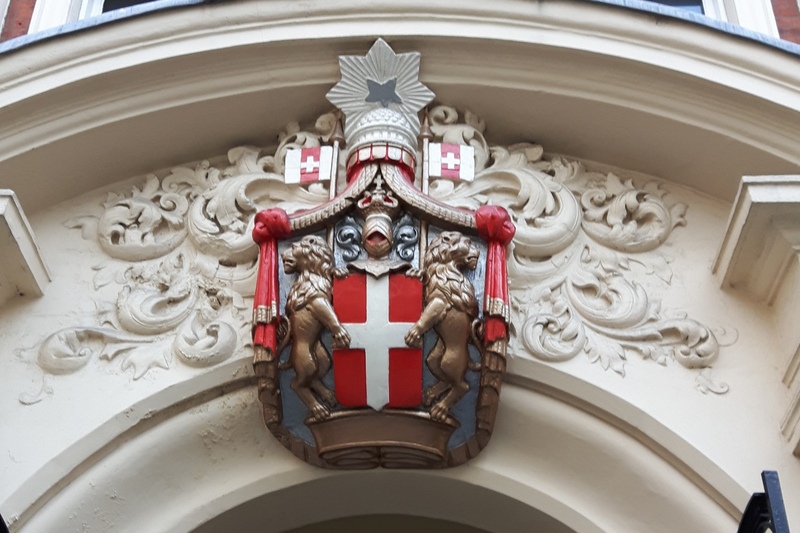 It served the poor of the city's large Italian community, many of whom lived to the east of the hospital in Finsbury and Clerkenwell and was served by nurses from the Sisters of Charity of St. Vincent de Paul, an order of nuns founded in Paris in 1870 to care for the poor and destitute. 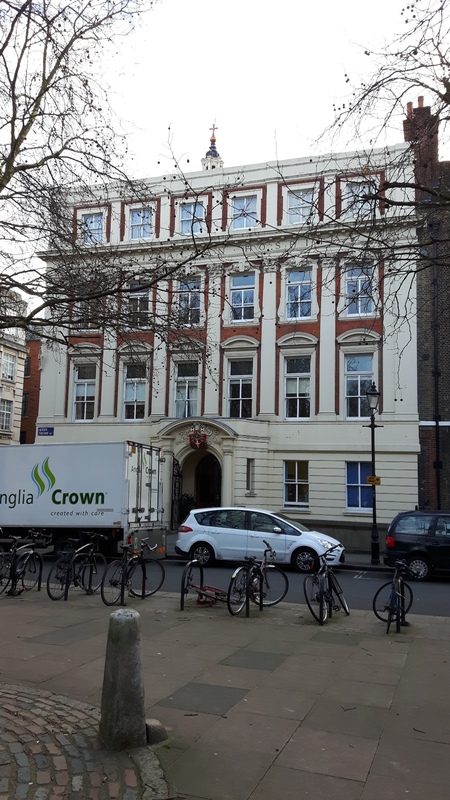 The premises were extended into Boswell Street in 1889, and shortly before his death in 1898, Commendatore Ortelli gave additional property to allow for the present purpose-built hospital building to be constructed. This was designed by the Scottish architect Thomas Cutler, with its distinctive staircase, small chapel under the dome, and the main wards with 50 beds on the first floor overlooking the square, which opened in 1900. The hospital had by now attracted patrionage from bot the British and the Italian royal families, and Ortelli's widow, Angiola, endowed a further extension in 1911, with an operating theater and isolation facilities. This was soon followed by an X-ray department. During the First World War, the hospital was used to treat injured British and Belgian troops. The economic difficulties of the 1920s and '30s curtailed the hospital work, and from 1922-7 it was only able to offer outpatient services after the Sisters of Charity withdrew their services. With the return of inpatient services in 1927, the takeover of the former Brown Bear pub on Boswell street added much needed additional space. The Second World War caused a crisis as Italy was now Germany's ally, and following extensive bomb damage in 1940 the hospital was closed between 1940 and 1948. A formal re-opening occurred in 1950, with the Sisters of Verona now providing the services. 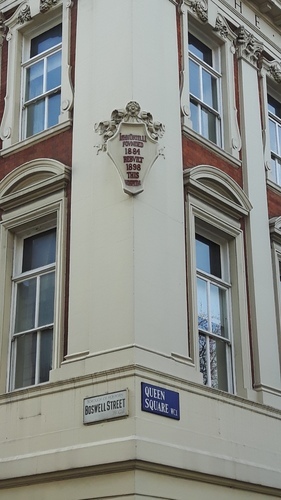 The hospital did not join the NHS when it was founded in 1948, and increasingly took private paying patients to subsidise the charitable work. 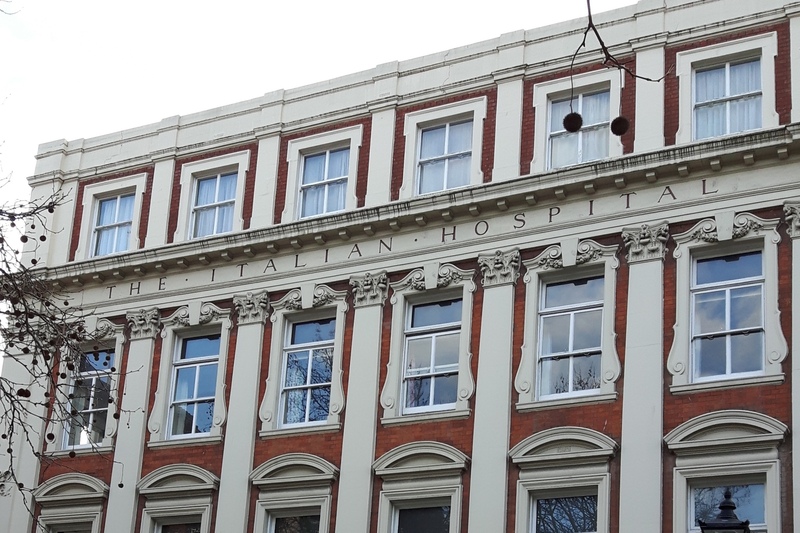 (…) However by the 1980s the ore diffused nature of the London-based Italian community, and the hospital's inability to offer the full range of services now privided by the NHS, meant that it was increasingly unviable and it closed in 1991"2. In that same year the former Italian Hospital was taken pover by the Great Ormond Street Hospital and now its building hosts some GOSH offices and accomodation for patients' families and the staff nursery. 1. See on Himetop the old "Hôpital et Dispensaire Français". 2. GOSH Museum and Archive Service, "GOSH Revealed. The Italian Hospital", Roundabout, May 2009, pp. 22-23 (courtesy of Nick Baldwin, GOSH Archivist).